As children grow up, they naturally become more curious with the world around them. Basic household items including window coverings can turn into potential hazards. 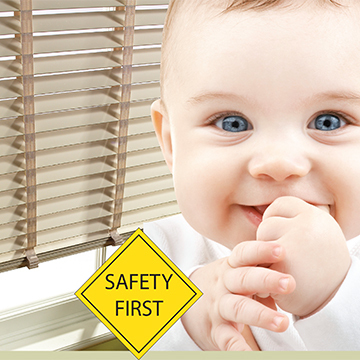 At Kavanagh’s we are committed to ensuring that our blinds are safe around children. We consider this as top priority. An integral part of the Kavanagh’s service is making our blinds safe for homes with infants and young children. Kavanagh’s is committed to adhering to the European EN 13120 standard (Internal Blinds Performance Requirements incl. safety) as a minimum safety requirement. As part of our compliance with these regulations all of our blinds have inbuilt safety mechanisms to help reduce any potential risks by ensuring the blinds are of reach to children. All of our blinds are supplied with cord or chain control systems. The standard operating length of most blinds with cord or chain operation has been reduced to a maximum of 1 metre to lower the risk of injuries on young children. Buyers and users of blinds should be aware of the hazards that can be posed by unrestrained cords, braids, loop chains and wires, which may be hazardous to young children. The following guidelines should always be considered.